I'm not sure where I'm going with this post. 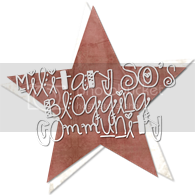 But since part of the reason I started blogging was to connect with other milspouses, I feel like I should say something - maybe. I'm just not sure what exactly. I don't like to get into the politics of these sorts of things, nor do I want to. But I also don't want to pretend it's not happening. So, here's what's happening for us. The Major is home, not working, not getting paid, and trying to make the best of it. In fact, there are plenty of things needing to get done around the house and our rental property, that this time off is kind of a blessing in disguise. 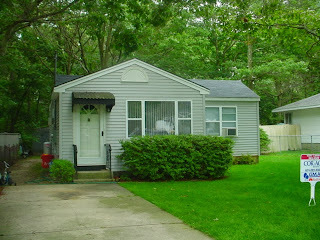 Our first home here in NY; now a rental property. He's patching walls, taking care of slow drains, cleaning the fish tank, and cleaning the basement. If this continues into next week, I might pick out a new paint color for our master bathroom! 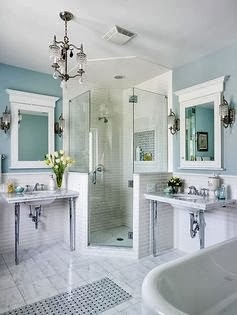 Or maybe a complete bathroom renovation? Since the Major is home, he's getting Tink and Lightning off the bus, so I've been able to work a couple of extra hours a day, which will help to supplement our income. It was nice to see a bigger paycheck than normal today! The extra time at work is messing up my dinner routine. I have less time at home to prepare whatever I might have planned. I may need to come up with a better plan for next week. In the meantime, we're doing our best to pinch pennies where we can. I took 2 bags of bottles and cans to be recycled last night. I usually wait till I have about 6 bags before I make that trip. And the Major said he put the truck on cruise control at 55MPH yesterday when he was running some errands. It's not much, but every little bit helps. And what would really be helpful is if Congress can finally do their job so my husband can go back to work. I'm praying that Congress gets their act together and starts doing their job! Amen! And you can always come here for dinner.